Alan Gordon Corrie, a successful auditor and commission agent in Brisbane, enlisted in the 1st AIF on 1 January 1916. Throughout 1917-1918 he served in France and Belgium as an officer in the 31st Infantry Battalion, and was gassed on at least one occasion. After the war he married and had two children, but died unexpectedly in 1925, aged 40. The great popularity of the late Lieutenant Alan Gordon Corrie was evidenced by the large number of mourners who gathered at the Toowong Cemetery to pay their last tributes…The floral tributes were so numerous that a special carriage had to be requisitioned to convey them to the cemetery. Alan was born at Kangaroo Point, Brisbane on 3 June 1885, the second of four sons of Lillian Mary née Button and Alexander Corrie. Both Alexander and Lillian were Tasmanian-born (Alexander in Hobart and Lillian in Launceston) and Alexander worked as a mining and insurance broker, helping to found the Launceston Stock Exchange. In 1882 he married Lillian and the couple moved to Brisbane three years later. In Brisbane, in partnership with his brother Frank, Alexander established the stockbroking company Corrie and Co., and was a founding member and first president of the Brisbane Stock Exchange. He was a prominent Freemason – as he had been in Tasmania - and he and Lillian were members of the congregation in Saint Andrew’s (then Presbyterian, now Uniting) Church in the Brisbane CBD. They were also involved in charitable activities and Lillian served on the committee of the Blind, Deaf and Dumb Institution. They had Alan baptised on 20 November 1886 by the Rev Edward Griffith, a prominent Congregational Minister in Brisbane (and after whom the archives room at Saint Andrew’s Uniting Church is named). Alan attended the Central State School and then the Brisbane Grammar School 1903-1904. He was a good sportsman – being in the rugby First XV both years he was at BGS, and a member of the rowing First IV in 1904. He was also one the six students who made up the School Committee in his final year. After B.G.S. Alan attended the Technical College, and was active in the Past Grammar School Football Club for a number of years. In 1908 he was the team captain and ‘Best Back’, with the team being runners-up in the Queensland Rugby Union senior premiership. Alan also played one game for Queensland that year. In 1909 he was again captain of the Past Grammar team, and was selected for the metropolitan team. In 1912 Alan joined with two of his brothers, Malcolm and Douglas, in business as auditors and general commission agents, based at 371 Queen Street in the Brisbane CBD. Alan was aged 31 when he enlisted on 1 January 1916. He gave his occupation as auditor and company secretary, and his religion as Presbyterian. He stood 166.4cm tall, weighed 64.9kg, with grey eyes, dark brown hair and a fresh complexion. After acting as Sergeant and then Sergeant Major, he was commissioned as a 2nd Lieutenant on 24 March 1916. Proceeding with reinforcements for the 31st Battalion, Alan embarked on the HMAT Seang Choon A49 in Brisbane on 19 September 1916. Alan was taken on strength with the 31st in France on 12 April 1917, and promoted to Lieutenant the following month. During these months the 31st was in the front line for periods at Delville Wood and Bullecourt. Later in September 1917 the 31st was heavily engaged at the Battle of Polygon Wood, fought in the Ypres sector in Belgium. In 1918 the major fighting for the 31st was in the pivotal Allied offensive known as the battle of Amiens, and pursuit of the retreating German Army throughout August and September back to the Hindenburg Line. The last key action for the 31st was at the St Quentin Canal tunnel (an important component of the Hindenburg Line defences). Alan returned to Australia on the HT Plassy late in 1919, with his appointment being formally terminated on 15 December 1919. 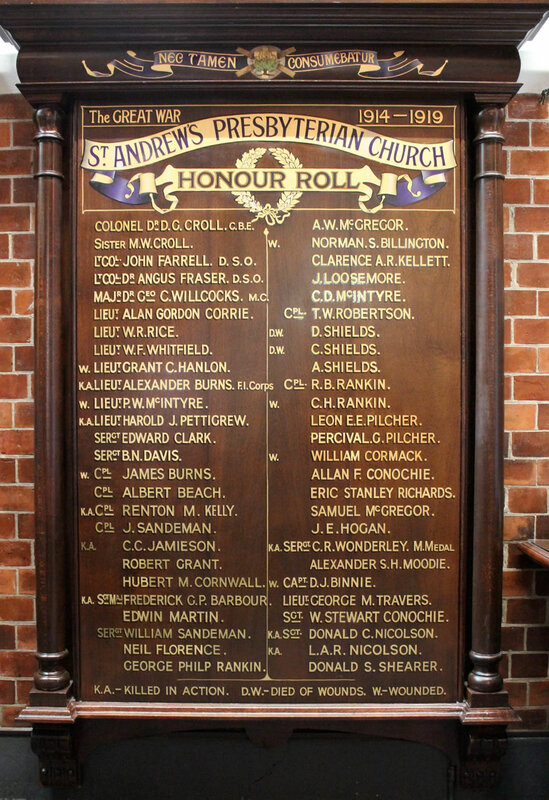 On 11 January 1922 Alan married Sylvia Frances Charlotte Kemp – daughter of Agnes née Scott and Sidney Francis Kemp, Inspector and Cattle buyer - in St Andrew’s Anglican Church, South Brisbane. The couple lived in Hillside Crescent, Hamilton and had twins named Sylvia Gordon and Raymond Gordon. When the twins were two years old, Alan died suddenly on 25 September 1925 in St Martin’s Hospital, Brisbane. The cause was recorded as acute colitis toxaemia and respiratory failure. He took a very keen interest in most outdoor sports, particularly football and swimming, and was at one time captain of the Past Grammar Football Club... His ability as an insurance agent was common knowledge, while it is said that in the last few years he established several new records for the business for the company he represented. His success in sport, as a soldier, and as a businessman was due to untiring energy and concentrated application to whatever he undertook. For some years past his health had been indifferent due, it was thought, to his having been badly gassed at the war. His death, however, was unexpected and sudden. As noted earlier, Alan was buried in the Toowong Cemetery. The funeral was attended by a large number of mourners and according to the report in the Daily Mail, the Rev Millar gave ‘an eloquent and inspiring address’. It seems that at some later point his son added ‘Alan’ to his own name – becoming Alan Raymond Gordon Corrie – and served in the RAAF in the Second World War. The widowed Sylvia remarried 15 years later in 1940, to William Gradwell. • Australian War Memorial – embarkation roll. • Brisbane Grammar School – Golden Book, Annals 1869-1922, School Magazines. • Diehm Ian. Red!Red!Red! The Story of Queensland Rugby (Playright Publishing, Sydney, 1997) p91. • The Brisbane Courier 26 September 1926 p6. • The Daily Mail (Brisbane) 28 Sept 1925 p9; 28 September 1925 p9. • The Telegraph (Brisbane) 12 January 1922 p8; 26 Sept 1925 p9; 28 Sept 1925 p8. • Sunday Mail (Brisbane) 18 Nov 1945 p6; 21 September 1947 p9. • The Examiner (Launceston) 24 April 1941 p4.